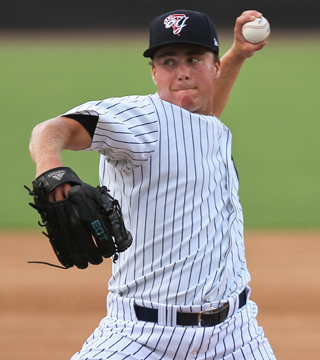 Lindgren was the rare draft pick who excelled so much in his first season that he was able to play in the rookie league, Single-A Charleston, Single-A (Advanced) Tampa and Double-A Trenton. Across those four levels in 2014, the lefty pitched in 24.2 innings, had a 2.19 ERA, a 1.014 WHIP, allowed 12 hits, and had 48 strikeouts and only 13 walks. He went from being the team’s top draft pick to the majors in only 353 days. This season at Triple-A Scranton, Lindgren has pitched 22 innings (15 games) and had a 1.23 ERA (1.92 FIP), 1.182 WHIP, 11.9 strikeouts per nine innings, 29 strikeouts and only 10 walks. Lindgren’s numbers in his 48 games as a pro are unbelievable: 39.3 K% and 75.6 GB% in 46.2 innings across five different levels. He didn’t have anything else to prove in the minors. His fastball is in the low-to-mid-90s, which is a plus pitch for a lefty. His fastball also has a lot of movement, which will help him when he faces big-league hitters. Lindgren’s strikeout pitch is a hard, diving slider, which could help him have success if he can continue to locate it. It makes sense that the Yankees called him up when they did because the bullpen outside of Dellin Betances and Andrew Miller has struggled recently. According to Ryan Hatch, since the 10 of 11 losses started on May 12, the Yankees’ bullpen owns the worst ERA in the major leagues (6.23 ERA). Two relief pitchers that have struggled recently are Justin Wilson and David Carpenter. Wilson, who has a high 5.79 ERA this season, has allowed six earned runs in his last 4.1 innings (7 games). Carpenter, who also a has a high 5.19 ERA this season, has allowed three earned runs including a homer in his 3.2 innings (4 games). Lindgren will be able to pitch in some of the spots that Joe Girardi was putting Wilson or Carpenter into the game. The Yankees, who lost 5-2 last night to the Texas Rangers on Sunday Night Baseball to move 1.5 games behind the Tampa Bay Rays after having a four-game lead in the division over the Rays on May 11, need more to turn around besides the bullpen but Lindgren’s addition should help. While losing 10 of their last 11 games the Yankees have averaged only 3.1 runs a game, the starters have a very high 6.42 ERA and the team has made 10 errors.